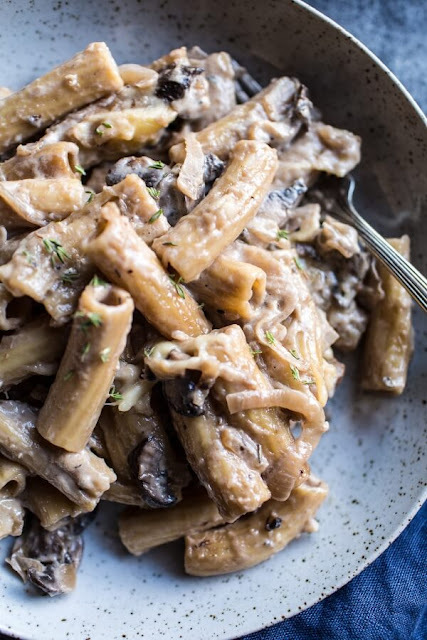 It’s like french onion soup, but umm, in pasta form!! Better?!?! Hmm, not sure. Both are so good. Can’t choose, but know this: the pasta version is kind of the ultimate hearty, cozy, wintery meal. Perfect for a busy weeknight or a fancy weekend in. And remember, the clean up is a breeze, leaving ample time for that thing called relaxing. Count me in! It's like french onion soup, but umm, in pasta form!! Better?!?! Hmm, not sure. Both are so good. Can't choose, but know this: the pasta version is kind of the ultimate hearty, cozy, wintery meal. Heat a large high-sided dutch oven over medium-high heat and add the butter. Add the onions + brown sugar and cook about 10 minutes, stirring frequently, until softened. At this point you want to slowly add the Worcestershire sauce and the wine, let them cook into the onions, add more and continue to cook. Do this until the the wine is gone or the onions are caramelized to your liking. Make sure the wine has evaporated. Preheat the the broiler to high. Toss the mushroom and garlic in with the caramelized onions, season with salt + pepper, cook another 3-4 minutes or until the mushrooms are soft. Pour in the chicken broth + water and bring to a boil. Add your pasta, bay leaves and thyme, cook, stirring often until most of the liquid has been soaked up by the pasta and the pasta is al dente. If you feel your pasta needs more water to continue cooking, add around 1/2 cup. Stir in the cream and a pinch of cayenne pepper. Stir in half the gruyere cheese and the gorgonzola cheese. Cook 2 minutes and then remove from the heat. Top with the remaining cheese and place under the broiler for 1-2 minutes until the cheese is melted. Serve warm, top with fresh thyme and parsley if desired. 0 Response to "one-pot creamy french onion pasta bake"